If after countless kale smoothies and gym visits, those fat bulges on your stomach, thighs, or upper arms just won’t reduce naturally, don’t give up! It’s not necessarily your fault; genetics also play a big role. Only now there is a solution in addition to liposuction or plastic surgery of any kind. 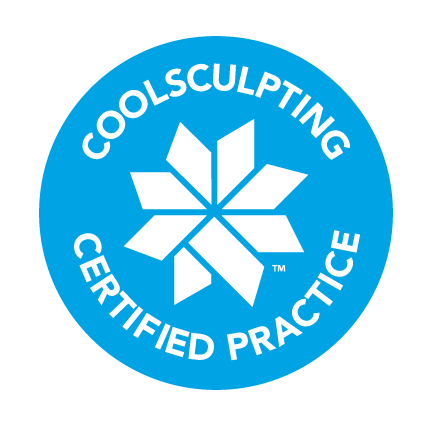 CoolSculpting® is a clinically proven, non-invasive fat removal procedure that uses the science of cryolipolysis to freeze away stubborn body fat safely, comfortably, and without scarring or downtime. Gainesville Dermatology Aesthetic Center is a CoolSculpting® Certified Practice, We are the area experts on body contouring technology and offer the latest CoolAdvantage® applicator, a CoolSculpting® machine that creates amazing results with shorter sessions and greater comfort — all you do is lay back, relax, and let the applicator do the work. So, are you ready to achieve a visibly firmer, more toned figure? Speak with one of our dermatologists in Gainesville, FL, today! Developed by university and hospital scientists and approved by the Food and Drug Administration, CoolSculpting® is a body contouring treatment that uses targeted cooling to freeze (crystallize) subcutaneous fat — the kind you can grab onto. At lower temperatures, the fat cells die, and then the body expels them naturally over several months. The procedure involves no anesthesia, no needles, and no knives, and so there is no scarring; no damage to surrounding nerves, skin, or muscles; and no lengthy recovery. And best of all, the results are permanent! CoolSculpting® has helped more than seven million people, both women and men. Although it is not a treatment for obesity or weight loss shortcut, CoolSculpting® is a non-surgical alternative to liposuction, a nearly painless way to cut fat and tone your figure. Next to having the procedure yourself, the best way to see the results of CoolSculpting® treatments is with before-and-after photos. CoolSculpting® is FDA-approved for multiple regions of the body. Stubborn belly fat is the main issue that patients tackle, while other areas for men and women include the upper arms, back, thighs, flanks, breasts, and chin. Individual results will vary. However, our dermatologists in Gainesville will create a treatment plan that gives you the best chance of seeing results. The images shown above are actual results, however individual results may vary. Results and patient experience may vary. *Noticeable changes to appearance may take longer. For more information, review our patient take-home guidelines for CoolSculpting®. Reward yourself brilliantly with Brilliant Distinctions. Earn points and save money! If you are postponing your consultation due to financial reasons, Gainesville Dermatology Aesthetic Center has the solution! We offer Coolsculpting® financing through GreenSky Patient Solutions to help you realize your fat reduction goals. The CoolSculpting® device uses suction to draw the tissue between a pair of cooling panels, which lower the temperature of fat cells to just above freezing. Those conditions are harmless on the rest of the body’s tissue, but fat cells crystallize and are destroyed. Over the next few months, the body processes and removes the dead fat cells as waste, while the treated area becomes more firm and toned. Like nearly all dermatology treatments, CoolSculpting® is suitable for most people, but not all. The best candidates share three traits: 1) visible bulges of subcutaneous fat — fat you can grab — in one or more areas of the body that are approved by the FDA for treatment; 2) reasonably sound health of body and mind; 3) realistic expectations. Situations in which the procedure might not be beneficial would include if you’re suffering from obesity and using this as the primary solution; expecting unrealistic results; or battling vasculitis, anemia, or another medical condition that’s exacerbated by the cold. Are you ready to find out if you’re a candidate? Take a short online evaluation, or schedule a consultation! How Much Does CoolSculpting® Cost? The CoolSculpting® procedure is very personalized, which means prices will vary based on the length and number of sessions required to achieve your objectives. Geography also plays a role in the price. In Gainesville CoolSculpting® costs could range between $2,000 and $4,000, on average. At Gainesville Dermatology Aesthetic Center, we keep our prices in line with current market rates. Patients also receive the benefit of being treated by experienced skin care specialists. Our physicians work with you to create a CoolSculpting® plan that suits your goals and your budget. What Is The Length Of A Treatment? The procedure takes as little as 35 minutes per treated area. Some patients elect to address multiple areas — such as the abdomen, love handles, and upper arms — or undergo several sessions on the same day. Depending on your treatment plan, a session could last from one to several hours. One CoolSculpting® session eliminates about 20 percent to 25 percent of the fat cells in the treated area. Many patients see results after a single treatment, but additional treatments may enhance those outcomes and provide even more physical definition. Depending on your goals and budget, our staff will help determine the right number of sessions for you. Where Does Fat From The Treated Area Go? The difference between CoolSculpting® and dieting or exercise is that the latter shrinks the size of the fat cells in your body, while the former eliminates them. Think of fat cells like the food you eat: once your body extracts the nutrients, the excess is removed as waste. The same is true of crystallized fat cells. After the CoolSculpting® device freezes the cells, the body recognizes them as being useless and processes them for elimination. Some cells are gone within two weeks, while the entire process might last between three months and six months. Once the cells are gone, they won’t return, which means your firmer new figure will stay that way as long as you don’t gain weight. What Does CoolSculpting® Feel Like? There is no topical anesthesia used during the procedure, and no pain medication is necessary afterward. Since CoolSculpting® technology uses vacuum pressure and cooling plates, you could feel some minor sensations such as tugging, pinching, tingling, aching, or cramping. But these minor discomforts are usually brief and end when the treated area becomes numb, if they occur at all. In fact, most patients feel comfortable enough during the procedure to read, work on laptops, or even sleep. Immediately after the procedure, the treated area may feel stiff. Temporary whitening of the skin (transient blanching) may occur. As your body warms up to its normal temperature, you may be slightly dizzy or nauseous. The treated area could be red for a few hours, and mild bruising or swelling could last up to two weeks. Compared to the long healing and recovery times associated with liposuction, CoolSculpting® side effects are minimal. Most patients go back to their normal lives right away, including returning to work or school. Changes to your body may be evident as soon as three weeks after treatment. Over the next three months, the treated area will evolve further, becoming more sculpted, firm, and toned. Your body may continue to eliminate crystallized fat cells for up to six months. While you aren’t obligated to take supplements or follow an exercise plan, the results can be maintained or even enhanced through healthy dieting and exercise. In fact, many people are inspired to take on healthier lifestyles after seeing their CoolSculpting® results. Alternatively, in the rare case that you put on weight, perhaps due to unexpected stress, additional CoolSculpting® sessions can be an option.